"We should strive to 'be partakers of the divine nature' (2 Peter 3:1-4). Only then may we truly hope for 'peace in this world, and eternal life in the world to come' (D&C 59:23). 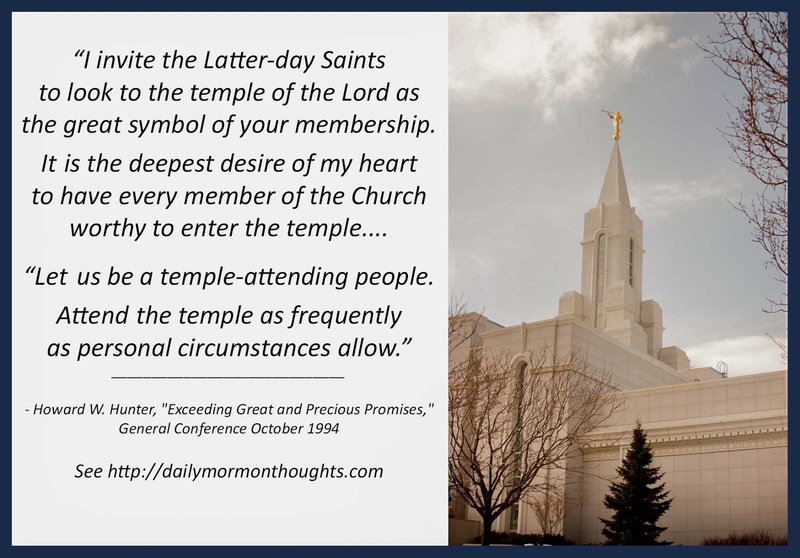 "In that spirit I invite the Latter-day Saints to look to the temple of the Lord as the great symbol of your membership. It is the deepest desire of my heart to have every member of the Church worthy to enter the temple. It would please the Lord if every adult member would be worthy of—and carry—a current temple recommend. The things that we must do and not do to be worthy of a temple recommend are the very things that ensure we will be happy as individuals and as families. "Let us be a temple-attending people. Attend the temple as frequently as personal circumstances allow. Keep a picture of a temple in your home that your children may see it. Teach them about the purposes of the house of the Lord. Have them plan from their earliest years to go there and to remain worthy of that blessing. 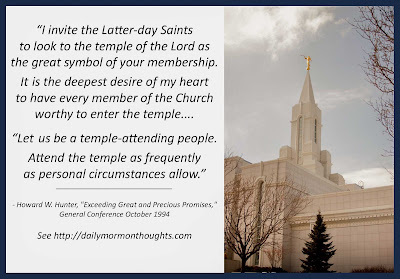 "If proximity to a temple does not allow frequent attendance, gather in the history of your family and prepare the names for the sacred ordinances performed only in the temple. This family research is essential to the work of the temples, and blessings surely will come to those who do that work." I love the invitation from Peter to "be partakers of the divine nature." As we learn more about God, we are moved to follow and emulate, and we begin not only to act like them but to gradually become like them, taking their very nature upon us. 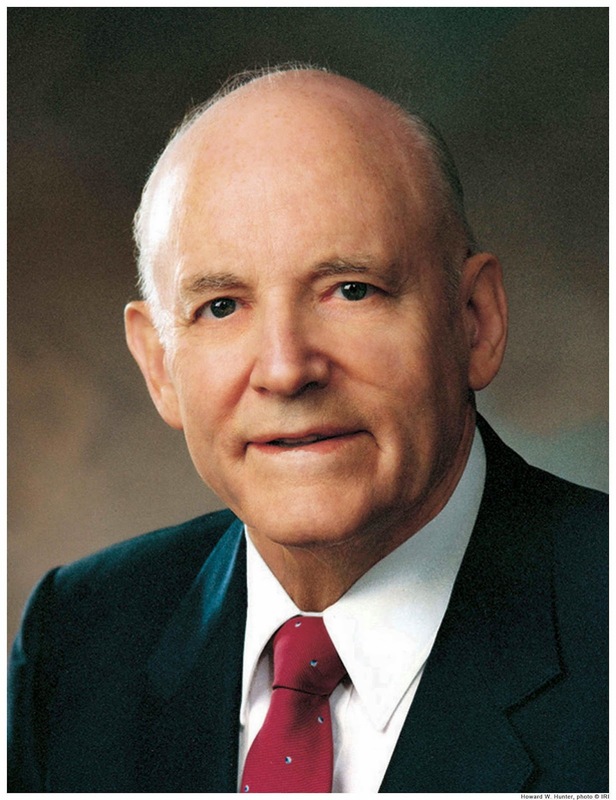 President Hunter suggests that a very real way to do that is through worshiping and serving in the temples. In the preparation to be worthy for those blessings, and in the action of attending, we truly become more and more like Him. The temple recommend is a wonderful symbol of Church membership. In our continuing search for peace and happiness, President Hunter assures us that "the things that we must do and not do to be worthy of a temple recommend are the very things that ensure we will be happy as individuals and as families." That's a great promise and a wonderful indicator of our efforts to take upon us His nature!